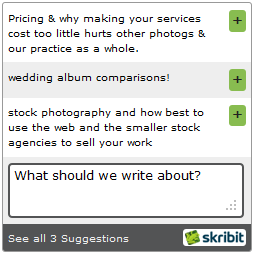 Skribit is a tool to help bloggers cure their writer’s block by crowdsourcing post suggestions. Readers get what they want to read and bloggers get ideas and a sense of what topics are popular with their audience. From their shutting down announcement, the official explanation is that Skribit only appealed to a niche group of bloggers and wider traction wasn’t forthcoming. Thus the team decided to move on to other things. Skribit widget blog integration – the widget is quite unobtrusive and could have been mistaken for another comment form, chat box or contact form. Differentiating the Skribit widget more clearly as a suggestion box and also providing information to users about Skribit may have helped (but it’s certainly a fine line between unobtrusive and garish). Bloggers themselves seemed to taken a laissez faire approach to using Skribit. They installed the widget and just let it go. In some cases, bloggers didn’t even install the widget and added only a vague “Make a suggestion” type link. Perhaps they needed to push Skribit more heavily in their blogs, but ultimately, if a new service requires that much active marketing by customers, then it’s probably going to struggle. Some bloggers pointed out that the Skribit widget was code-heavy and slow (at least in the early versions). Moreover, the business model seemed a bit suspect to me. Skribit employed a freemium model with a free basic account and a PRO account for $24.95 per year allowing for unlimited blogs, unlimited suggestions (normally limited to 15 active suggestions on the free account), suggestion moderation and widget customisation. Skribit never revealed the number of PRO account subscribers they had, but I can’t imagine that it would’ve been too many given the PRO features really aren’t very compelling. Overall, from a complete outsider’s perspective, the Skribit team seems to have been too ambitious in their expectations – they wanted a big win in a crowded space of social media applications and tools. The service was popular enough amongst bloggers although it may have taken Skribit a longer time to differentiate themselves from other services. The business model was also probably in need of a workover. While Skribit could still work as a side project, it appears as though the team ran out of both funding and interest.